Was T. rex a speedster after all? Dinosaur expert James Farlow, of Indiana-Purdue University in the USA, and a colleague, concluded that the sheer size and weight of a large T. rex meant that it could never have achieved such speeds. As an animal’s size varies, everything else does not scale up or down in proportion. Thus, if a horse fell down a mineshaft deep enough for it to break limb bones, the same fall by a mouse would leave it unharmed. An elephant, on the other hand, would likely splatter and die instantly from the same misadventure. For the same reason, while elephants can reach appreciable speeds at full gallop, they can’t hurdle over fences that a horse would take in its stride. And their speeds relative to their body size are pathetic compared to many of the most humble insects. ‘… simply tripping [a charging T. rex] up or getting its feet somehow tangled would have been enough to smash it into a lifeless heap. ‘Farlow and a physicist colleague have calculated that the huge beast was so heavy and high that if it tripped and fell while running, a tumbling tyrannosaur’ torso would have slammed into the ground at a deceleration of 6g (six times the acceleration due to gravity). Its tiny front legs would have been inadequate to substantially break its fall. The relevance of all this to creation/evolution is, of course, that humans would have little to fear from this dinosaur that could be killed by merely tripping it up, and which would likely have moved very slowly to avoid any risk of an accidental stumble. We also reported in 2001 on the comment by ‘Dinosaur Jack’ Horner, the famous fossil expert after whom the hero in Jurassic Park was modeled, that T. rex ‘couldn’t run’, because its thighbone was longer than its shinbone, contrary to the pattern in fast bipedal predators of today. This was claimed to be the most accurate assessment of dinosaur speeds to date; it suggests that T. rex could reach speeds of nearly 30 km/h (18 mph). While not exactly in speeding-jeep territory, this is slightly faster than a fit sportsman can run. It’s reasonable to ask whether this should cause one to discard the previous ‘ultra-low-speed’ assessments. Maybe—but first it’s worth briefly discussing this 2007 research, which was based on computer models of the biomechanics. While this approach accurately predicted human top speeds, and included many more variables at a higher degree of sophistication than previous such attempts, there is no indication that the above issues, particularly the crucial one of tripping and falling to death, were taken into account. So even if tyrannosaurs were biomechanically capable of these sorts of speeds (by no means a settled question) natural selection (a fact of life) would actually tend to eliminate tyrannosaurs which were programmed to habitually charge after their prey at top speeds. And their short arms would have been nearly useless in breaking their fall. Finally, even in the unlikely event that tyrannosaurs were capable of outrunning and killing humans, it would not mean that humans would be wiped out by these beasts, and thus be an argument against the biblical coexistence of humans and dinosaurs. Elephants can outrun and even kill humans. Yet human ingenuity, even when only spears, rocks and traps were available, has always seen elephants at greater risk from humans than vice versa. 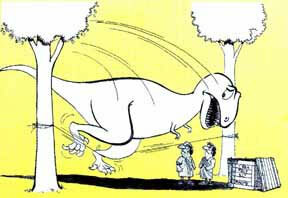 There is no reason to think that the same would not have been true of even the largest carnivorous dinosaurs. See C.Wieland, The bigger they are … March, 1996 Return to text. www.physorg.com/news106988114.html, August 22, 2007 Return to text. T. rex toothmarks have been found in Triceratops bones, but none to date with the crucial ‘kill’ pattern. Return to text.